With over 10 years of experience, Cooksongold Precious Metals is the UK’s largest one-stop-shop for jewellery makers. We hold over 11,000 items in stock ready for next day delivery. · Gold, Silver, Platinum and Palladium Sheet, Wire, Tube and Solder Beading tools · Findings · Jewellery making supplies, tools and Accessories · Silver Clay · Gemstones and Swarovski Crystals Simply order before 3pm and we guarantee to despatch same day! Need help and advice? Online: Shop online at www.Cooksongold.com! Why not look for your answers in our Knowledgebase or talk with thousands of jewellers who regularly use our Forum, Facebook and Twitter sites? Trade Counters: Visit one of our trade counters in Hatton Garden, London or Jewellery Quarter, Birmingham: take a closer look at our bullion products and jewellery making supplies, find exclusive deals and expert advice. Contact Centre: Get in touch with our friendly staff at the call centre either via email: birmingham.sales@cooksongold.com or by calling Customer Services on 0845 100 1122 or 0121 200 2120 – local rates apply. Lines are open Monday – Friday 8 AM – 6 PM. We are always delighted to hear from you! 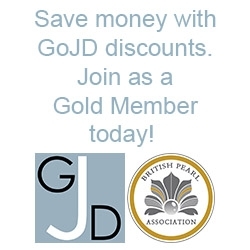 Address Cooksongold Precious Metals Ltd 59 - 83 Vittoria Street Birmingham, B1 3NZ United Kingdom Cooksongold are pleased to offer the following discounts to Gold members of The Guild of Jewellery Designers *Please login to your member account to view under 'Active Resources' in the main dashboard - Gold Members only** Extra discounted items added: Art Clay and PMC (Click the link above) A discount for Guild of Jewellery Designers Gold members on the first Direct Metal Laser Sintering technology designed for the jewellery industry from Cooksongold To do this we would need an STL file of a design generated by any of the cad/cam software that is currently available. Please then send the design to us in an STL file format using our "wetransfer" service which can be accessed via our website www.cooksongold-emanufacturing.com Please indicate yourself as a Guild Gold member and your individual membership number. On the website you also will find further details on the technology and what it has to offer. The quotations we provide are based on a piece by piece basis for each customer determined by yield and build time so we would be happy to provide a quotation for your designs, For Guild Gold members only we are offering a significant discount which we will display by providing a non discounted quotation also. R&D so far has centred on 18k 3N yellow gold and we have now commenced work on 18k white & 18k red. The development of metals such as 925 Std Silver, Platinum, Palladium and other gold alloys is also on the horizon. All gold alloys will become available in the future. Titanium is available through our bureau service and we will be adding 316L stainless steel soon. Please read our design guidelines here on the Guild forum >> ***Cooksongold Discount - Important Information for Gold Members*** The discounts from Cooksongold are applied straight to your account with them. When you first become a Gold Member we ask for your Cooksongold account number on the sign-up form which is then passed onto Cooksongold by ourselves and we inform them of your Gold Membership. Your details are then passed to their accounts department who will apply the discounts to your account: this process should take between 24 - 48 hours (excluding weekends). It will mean that each time you order from them you will automatically be charged a discounted rate, although the discounts will not be shown on your invoice - just the lower rate. Please ensure that your discounts are in place before you place your first order with Cooksongold, as discounts cannot be claimed on orders retrospectively. To check the status of your account: - visit the Cooksongold website http://www.cooksongold.com/ - place some discount qualifying items* in your basket without logging in and note the value of your basket - then log in and if the value of your basket decreases you know that your discounts are in place. If it is apparent that the discounts are not operating on your account 48 hours after signing up for Gold Membership, then please contact us and we will raise the issue with Cooksongold. If you need to contact Cooksongold with regard to your discounts then please call Carolanne Round on 0121 212 6486. * check the range of discount qualifying products from Cooksongold by logging in to your GoJD account dashboard.